😀 – The Force is strong with this one. 🙂 – I’d read it again. 🙁 – I have a bad feeling about this. Paragon: 🙂 – I’d read it again. Savior: 🙁 – I have a bad feeling about this. I decided to review all four books in one set since the e-books were so short. It was difficult to come up with a complete rating for each one since one book was on the low side of “Meh…” and another was almost a four-star effort, but I stand behind my shrugging humph as I think upon what I have read. While I liked some better than the others, the series fell a little flat for me, both in mechanics and in general storyline. What bothered me the most was that there was not a proper balance between “show versus tell” throughout the entirety of the series and, while “show versus tell” is something with which many writers suffer, I came into this series expecting far more from a seasoned author like Miller. Right from the start, I was thrown into a completely unknown landscape with very little to help me grapple with what I was being told and that, more than anything, brought out my old skepticisms about science fiction literature. A part of me feels like any reader should be able to pick up any book about the galaxy far, far away and should instantly be able to fall into the novel without little to no background knowledge. With Precipice, there were several times in that first chapter where I had to keep backing out of the novel on my Kindle to make sure I was reading the first book in the series. I was completely lost! Granted, my Star Wars knowledge is limited, but I honestly thought I needed some kind of Star Wars concordance by my side to help me understand what I was reading. Perhaps it is just because I am still fairly new in this journey of mine, but I think that strong storytelling about this universe should assume only a few things: 1) That the reader has at least watched some of the films and 2) Even if the reader has not seen the films, he or she at least knows that there are Jedi and Sith, there is the Force and that lightsabers come in several colours and can cut everything. Unless the novel explicitly picks up after another series, there should be few if any assumptions made. 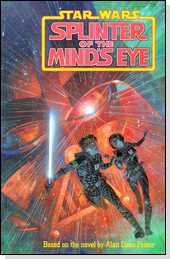 In Splinter of the Mind’s Eye, was it helpful to have watched or have read the novelization of Episode 4? Of course! That’s why the cover had “From the further adventures of Luke Skywalker…” in bold letters at the top. The reader knows going into the novel that if the name Luke Skywalker does not ring a bell, he or she is going to miss a lot of the novel. I also equate this idea to reading The Lord of the Rings. Is it helpful to have read The Hobbit and have some understanding of who Gandalf is and what hobbits look like? Of course! Yet, Tolkien does not jump into the story assuming the reader has read what was actually a prequel of sorts to his masterpiece. If I sound like I’m ranting a bit, it is simply out of the frustration of not having any idea what was happening for close to a full chapter and one of the longer ones in the novel, at that. I knew next to nothing about who I assumed was my protagonist, names were being dropped left and right to the point that I was truly turned off by what I read. Honestly, imagine watching Return of the Jedi without ever knowing a thing about Star Wars and picture the opening scene. Two random robots are walking in the middle of some desert, you have no idea who they are, where they are or why the little one beeps instead of talks, and the one that is talking keeps referring to some guy named Luke and something else about a princess. Even the opening scroll would not help you get far and the rest of the film would make no effort to explain anything to you. This is acceptable in ROTJ because it is a part of a trilogy so assumptions can be made. I had nothing to help me understand whether or not Lost Tribe of the Sith was a part of another series, I was thrown a lot of names in those few pages and, thus, I was frustrated. My frustrations were also deepened by how the novels flowed. Far too much detail went to facts that did not make a difference by the end of the series, whereas characterization were, in most cases, left to basic summaries. In Precipice, was it really necessary to read about every single muscle Korsin flexed as the Omen crashed on Kesh? Did the reader really truly need to see each facet of Keshiri life before getting on with the rest of the story? Likewise, why was the reader simply told about the history between Korsin and his brother instead of allowed to see a part of it before their jump to hyperspace and the eventual crash? This is where the balance between “show versus tell” comes into play. Far too many scenes in the novel were shown when they could have quickly been told and vice versa. In my eyes, if the author was going to spend eons describing what could be summarized, then the novellas should have been great epics of detail from every character down to the last sparkle of the rocks on Kesh. Once I moved past the initial shock of being thrown into a novel with a back story I may never learn and the long spans of description that came to nothing in the end (seriously, several thousand words were spent on the crash alone and it made not one bit of difference how the ship crashed in the end), I did enjoy many aspects of the series that caused me to think of the Sith on a deeper level and encouraged me to continue with the novels on my list. As I said earlier, the beginning caught me off guard, like a Chemistry mid-term on something the professor never covered in class, and there were several times in the novel where I was shouting to myself, “Let’s get on with this! Somebody bring out a lightsaber!” That initial boredom was quickly overshadowed by the Sith themselves. The idea of “pureblooded” Sith was completely new to me and utterly fascinating. These red-skinned people had somehow interspersed with humans and other species creating other Force-sensitives, but in a sense, not as attuned to the dark side as a pure-blood Sith would be. The only part that dampened my new-found intrigue with the Sith were some of their conversations. Some of the discourse between the Sith sounded almost ordinary and just as balanced as the Jedi, albeit in a slightly more sarcastic light. I had always imagined that the Sith were a mysterious and magical sect so bereft of the normalcies found in non-Force sensitives that they were barely capable of holding almost jovial conversations like the above quote. This view has also been reinforced by what I had seen in the films and in Clone Wars. I suppose, however, that this runs with the idea of what Anakin was screaming at the end of Revenge of the Sith; the Sith are just as “normal” as anyone, depending on a certain point of view. The idea that the Sith ran in a gamut of shapes, sizes and colours was the complete “Oh wow!” moment in the book. Again, the films leave one with the perception that any Force-sensitive being is human since it takes a humanoid form to hold a lightsaber and, ergo, master the Force. I was delightfully surprised to “see” the array of Sith colour; from the pure-blooded red Sith, to every other colour in the rainbow. It was like viewing the world through John Lennon’s Imagine, but then brought back to your senses by the fact that they all carried “evil-coloured” lightsabers. Further fascinating for me was the concept of something as basic as drug use in the GFFA. Korsin’s brother is an addict and I found myself sympathizing with his plight, regardless of the fact that I have had no similar experiences in my own life. That said, I also find that the more I read, the more the GFFA begins to mirror real life, but in a manner that makes the characters appear simultaneously down-to-earth and still like the wayward warriors they are. In the end, though, the Sith did live up to what I expected Sith to do and I had to hold back a cold laugh at the callousness of the protagonist in the last chapter. What I enjoy most in an anti-hero like Korsin is whole-hearted evil and cruelty. It does not due for a villain or the protagonist’s character to be wishy-washy or grey. What Precipice confirms (at least for me) is that the Sith are evil, but some are clearly more evil than others. By the time I came to Skyborn, I had imagined I could not be shocked again by another onslaught of information I did not understand, but once again, I was proven wrong. Within the first few hundred words, I was wondering if I was reading a story within the same series. The beginning of Skyborn was packed with so much mundane detail that I was certain that The Lost Tribe of the Sith was just a collection of short stories that were in no way interconnected. Of course, by the end of the second chapter, I finally saw the connection, but much of the second book of the series left me a little muddled. Since I was unable to see how Adari and her Keshiri people related to the Sith, I found myself, again, wondering when the author was planning to get on with the actual story. Like in Precipice, detail upon detail was lain upon the reader, this time about the purple-skinned Keshiri and their view of the world, when much of this could have been summarized rather quickly without hurting the story. When considering the novel on whole, Adari’s characterization frustrates me almost as much as my initial confusion in Precipice. Initially, I was not intrigued by Adari as a protagonist. She did not reach me on a “womanly” level or otherwise and I think what made this most apparent was the description of her love, or lack thereof, for her children. Adari had her children simply because it appeared to be the appropriate thing to do and had no love for them. Even the Sith love their children, so what does this say about her? I cannot see her apathy towards her children as a more masculine quality either. It just feels fake and unbalanced. I am one of the last people to stigmatize the role of women in literature, but I have rarely seen the aloof mother done properly where some kind of vice was not involved and, even in Moth Smoke, one of my favorite novels, the author was discussing a woman who cared for little outside of herself. Adari obviously cares about rocks, but she just disregards people. Adari is presented as more level-headed that the rest of the Keshiri, but lacks the outright selfishness necessary to make her behaviour to her children and her people believable. That is not to say that a lack of a maternal instinct is tantamount to selfishness, but for something that is so ingrained in womanhood, there needed to be more than just a few lines telling the reader that Adari did not love her children or motherhood. Adari’s heresy trial, while somewhat amusing with its Scopes Monkey Trial meets Star Wars storyline, has incredibly little to do with the actual plot. Her chief “prosecutor” is given a plethora of detail and back story, but Izri Dazh plays no part in the overall story. this story just got a million times more mundane. really? we are just reading about a darwinesque stone trial? even when described in the context of another world it has been done so many times it is simple and inane. I suppose Izri plays the Dr. Zaius in the story, but he shines brightly for a long while before fading into inconsequence. This is not to say that Miller could have summarized everything about the Keshiri by saying, “All folks down in Tahv-ville believed in the Skyborn a lot, but Adari, who lived just north of Tahv, did not.” but all the detail just became overbearing. What would have made an incredible story would have been to make it one complete novel, where the first chapter showed the reader what was happening to the Sith, the second chapter discussing Adari and the Kesh, the third including more information about the Sith on Kesh and so forth until Adari meets the Sith, bringing the two parallel stories together. I could not help but notice, however, the glaring dig at religion Miller inserted into this story and, while I would like to see his ultimate point being that science can break down anything in the universe into matter, energy, space and time, a dig is still a dig no matter how annoying. What I did enjoy was when Adari met the Sith. Miller did an outstanding job of presenting how the Sith would appear to someone who knew of nothing outside of her terrestrial bounds and this was where the overflowing detail was finally put to good use. The reader got to “see” the Sith precisely how Adari saw them which helped paved the way for the third and, in my opinion, the best novel of the series. The second half of the novel is what kept me drifting between two ratings for the whole book. While the first half was drab and grey, the second was full of life and colour, much like in The Wizard of Oz when Dorothy steps out of her Kansas home into the beautiful land of Oz; the two halves are like night and day. By the end of the book, I found myself, again, wishing that Miller had made this one continuous story. While I found the italicized trips into Seelah’s memory a little heavy-handed, I think Miller did a good job with the memories and with the third novel altogether. There was more of a balance between “show versus tell” in the third than in any of the others and, even though, Miller did include irrelevant details in this book as well (again the memories), the details did not distract one long enough to wonder where the author was going with the book. At this point, the groundwork has been laid and all that is left is story. I did find it difficult to believe that the Sith were still earnestly attempting escape after fifteen years on Kesh, but their actions were exactly what I had expected of them; a lack of justice for the voices of the weak and a complete sense of power and control. Fascinatingly enough, the one I had thought who would feel the most comfortable overpowering a Force-lacking species, was the one most anxious to still leave the planet. All this notwithstanding, Paragon was far from perfect and some of the same questions I had about the ability to “see” using the Force while watching ROTS, sprang up in this story as well. In ROTS, I found it amusing (for lack of a better word) that the Jedi, who could sense the slain souls of fallen Jedi half a galaxy away, could not sense a Sith lord sitting just a stone’s throw away from them, i.e. : Yoda sits directly across from Palpatine in the beginning of AOTC, but other than simple mistrust thrown at any politician, there is no sense that Yoda senses a real disturbance in the Force. In Paragon, I see marked similarities, though on a smaller scale. Ravilan, a red Sith and from my limited understanding, a pure Sith, should have been able to “feel” or interpret the Force with far greater accuracy than any of the humans around him. Why Ravilan could not see or sense Seelah’s murders on a Force-limited planet like Kesh is just mind-boggling. As soon as I had read that Seelah oversaw all births, I assumed she was doing something naughty and this intuition was without anything that came out of her past memories; this was based solely on her character in the past two books. Adari’s character seemed a bit shunted to the side for the greater part of the story and I could not help feeling slightly betrayed considering the amount of time spent on her in the previous book. I also did not like, or perhaps I simply did not understand, the end and Adari’s newfound desire to return the Keshiri lifestyle back to its roots. In hindsight, this was just the beginning of what would become a truly mundane end to the series. This novel was what almost brought the entire series down a complete notch for me. There are so many issues that I could probably take up the remainder of my blog space complaining about it, but instead, I will focus on characterization. Adari Vaal began as the wayward heroine to the series and, robbed of what could have been an incredible rise and a fantastic level of depth, Adari’s character was left lifeless and bland. There were several points in Skyborn and Paragon that Adari seemed to have some promise, but in the end, she was simply wasted. What caught my attention most in Skyborn, infuriated me most in Savior. Skyborn presented the reader with an Adari who was the heretic, the mother to children she barely loved, and the geologist who would rather spend her time examining rocks than interacting with her own people. How and when and, better still, why did she develop these feelings of patriotism about her homeland and her people? I was at no point struck with the sense that Adari particularly cared for her own people and Korsin’s fascination with her throughout the second and third books gave the perfect setup to have Adari either run away with the Sith should their help arrive or overthrow Korsin to set herself up as the supreme leader of her people. Good God! She had ample opportunity! She reunited the Skyborn with the Keshiri; Adari could have, should have, claimed herself queen/empress/Skyborn Elect/whatever over her people and, if she harbored some understanding of injustice, why not use her newfound power to overcome the Sith and bring her people into a Kesh Age of Reason? The Keshiri are so numerous that they don’t have a number to count their population. Surely, amassing an army devoted to their Keshiri-Skyborn could have helped take down the Sith. I am not saying it would have been easy or bloodless, but anything would have been better than what came of Adari in the novel. Adari’s plan was comical in its inanity. What it proved was that she had learned nothing from spending twenty years amongst the Sith. She had spent years in their inner circles and, even if she was not Force-sensitive, she surely could have learned enough about the Sith and the ways of the dark side to come up with a plan better than what was presented. Were the Sith not a resourceful people? Could they not, knowing that food and shelter were just a ways off, have fought and clawed their way back to the mainlands eventually? She spent a minimum of ten years drawing up plans and the idea to “strand” the Sith was best someone with inside knowledge could create? It is unthinkable! Adari’s character had so much promise and yet it was all for naught. Even worse were the open questions that will never receive answers. Why devote an entire novel about a single character and her view of her world only to have her dissolve into mediocrity in the end? Why would a character with such spirit and so out of sync with the rest of her people, even want things to go back to the way they were? The reader was told a million times that Korsin thought the world of her, but why? We were not shown anything out of the ordinary about her other than what was given before her encounter with the Sith and yet, somehow, we are left to decipher what specific actions of Adari endeared her to Korsin. I just can’t stand it when great characters are just wasted; it is like they are brought to life with a real purpose, but laid to rest never realizing their full potential. I may not have been able to immediately associate with her, but Adari’s character had great potential to become like the Sith, yet the antithesis of them at the same time. What was probably most disappointing about the last book and the series as a whole was that the series did not leave me feeling like I was further enlightened in the Star Wars universe. There are likely other series I kicked off this list since Lost Tribe of the Sith made the cut in my first glance that would have been far more gratifying, but it will be a long while before I even get to them. Unlike with the first two books on my list, I don’t feel like I have learned anything significant from the series. Since I was reading about completely foreign characters who were not developed as well as they could have been, I felt nothing when reading about their deaths or banishments. There was nothing more than a, “Okay…I guess it’s over, now.” when I got to the end. Actually, it was more of a “He’s going to end it like that?!?! ?” but either way, I was not pleasantly surprised as I had been with the last two. It was evitable though; there was no way I would be able to read 91 books without coming across a few that did not settle well with me. Oh, well…Onto Darth Bane: Path of Destruction! My rating ~ : 🙂 – I’d read it again. The novel, the first true instance of the Expanded Universe, felt like a complete lesson in Star Wars for me. Only two novels into the Star Wars universe, I already see the underlying story in a clear and bright light. So many things I had never considered sprang to mind while I was reading and when I got to the end, it seemed as if I had come out of the book a little wiser. It was not until the scene where Luke was attempting to get Leia to appear less regal that it occurred to me that Leia was actually a princess and often behaved like one would expect a wealthy monarch to behave. In the films, she came across as simply bold, but the novel gave me a little more insight into that boldness. Likewise, there were parts that, while pulling me out of the fictive dream (though, at no fault of the author), expanded my thinking about the characters/inhabitants of the Star Wars universe. “‘I am told this mining is an expensive venture. The Empire is smart enough to save where it is able,’ he concluded with pride. Even while reading “Episode 4” and gaining some insight on the idea that all or most of the Alderaanians actually perished in the first full test of the Death Star, I never considered the day-to-day folk that interacted with, or were part of the Empire; that they would have normal lives and even think of things like a salary and retirement. Intriguing me further is what happened to all the people who had remained loyal to the Empire after Episode VI. Going beyond that even has me wondering about the people who possibly sided with the rebels before and during The Clone Wars, but then decided to “play it safe” and remain loyal to the Empire during the next rebellion, again finding themselves on the losing side. I suppose that is why I’ve got this great reading challenge, but still, I am intrigued. Most striking in this novel, using my knowledge of the prequels, was how much Luke and Leia model their parents and how their personalities differ from what one would expect. Leia is often quick to anger and has an absolute surety in herself that goes beyond being raised a monarch and, by contrast, Luke is far calmer throughout all of their hardships and surprises. Leia’s personality reeks of her father, while Luke encompasses all of Padme’s rational and sensible, albeit sometimes passive, calm. All of this pondering and wondering aside, I enjoyed the novel on whole. The underlying story of trying to find a crystal that could enhance the Force came across as fascinating, though it made Rumiko Takahashi’s InuYasha manga appear far less original for me. The new world was a treat to discover along with more of the Empire’s dealings and simply a wider view of how the people in the galaxy far, far away interacted with one another. All this notwithstanding, there were some parts that confused or disappointed me. The mechanics of the novel were far different from the first; the sentence structure was far more jagged and broken, perhaps creating some misunderstood rhythm, but the change was definitely noticeable. Parts of the story also seemed a bit rushed to me, especially Halla’s character. Halla’s appearance came across as far too easy and, while a part of me believes I think this way because my knowledge of the prequels, but the characterization just seemed off-balanced. It reminded me of reading Christopher Paolini’s Eragon for the first time and how the mythology he presented felt like he was just trying too hard to come up with something original. In fact, even by the very end of the novel, I still did not trust Halla as I was not keen on our protagonists trusting this person who had come out of the blue with all this knowledge and a pension for help at no cost. I would have liked to see some more distrust coming from Luke, especially after their separation. When Halla describes herself as simply ambitious, I started to suspect as ambition feels like a very un-Jedi-like quality and, as he knew virtually nothing about her, I wondered why Luke had not bothered to ask more questions. Obi-Wan had mentioned that Vader had helped hunt down and destroy the Jedi after turning to evil, so why hadn’t the question come up about how Halla managed to escape Vader for so many years and, better still, why did Luke never questioned whether Halla was good or evil when he understood she was Force-sensitive? Vader was Force-sensitive, was he not? There were also a few places were the characters seemed to contradict themselves, most notably Luke. In the beginning of the novel, Luke discusses some of his studies on Tatooine and his lack of interest in zoology, “only the stars.” Much later, however, Luke pulls an entire alien language out of almost nowhere, which means he must of brought his head out of the clouds for long enough to study languages and culture, i.e. : anthropology. While zoology and anthropology do not fall hand in hand, in my eyes, if Luke was as focused on the stars as he had earlier said, he would not have been able to pull the language of the Yuzzem from past studies at the opportune time. It sounds to me that Luke would have been just as interested in the ecology of other planets as with their cultures. It is like describing snow to someone who has never seen it. The listener is entranced with something the storyteller would find very simplistic. I imagine it would be the same with Luke; learning about all the flora and fauna of other worlds would preoccupy his time when he was trying to get off the sand-ridden Tatooine. I would have liked to see Grammel’s character expanded more. There was just so much potential with him, but we only got to chip the surface of what appeared to be a very deep character. From his initial descriptions from Halla to his final demise, I had hoped more would come of the character and, from the way he was written, a part of me wonders if more details of Grammel had been included in an early draft of the novel, but were shed by an editor. What completely caught me by surprise was the outright violence of the novel. I am still unsure whether the violence gratified or disgusted me. On one hand, I am unaccustomed to getting a full dose of anything more than mild PG violence from Star Wars and, since reading something always makes it far more acute for me, I experience the violence to a greater degree. The higher detail of violence comes across as so foreign it is distasteful, but on the other hand, it enriches the story and truly brings it alive in front of my eyes. What leaves the matter further muddled is that when compared with what I have seen in the films and Clone Wars, the violence is not really that bad, but it is only when I read such depictions that I think about exactly what happened. That is, thoughts of, “Whoa, that soldier is not just dead…he’s dead.” spring to mind to make the whole experience more real for me, which, again, can be both bad and good. Luke and Leia’s…um, relationship, was rather interesting to read. Strange as it may sound, for the majority of the novel, I found it easy to forget that Luke and Leia were siblings as they wandered about Mimban. In fact, at times, I was so entrenched in Luke’s mind that it almost possible to forget that the mild sexual tension between them could have been perfectly normal…almost. There were also points where I was simply amused by how close Foster came to the complexity of the emotions coursing through Luke and Leia. They both “feel” something and they (or at least Luke) think it is some kind of romantic love because they simply don’t know any better, which brings me to something I touched upon in my review of “Episode 4” and I know I will bring up again. Towards the latter end of the novel, Luke picks up the “disturbance in the Force” and knows that it is Vader, which intrigues me to no end. Out of all beings in the universe, her mind jumped to Vader. Why? Why not Essada himself since she apparently goes into shock anytime anyone refers to him? Better still, why not think of something in regards to the jewel they are seeking? Hadn’t she been the loudest opponent of the expedition to find it and was she not distrustful of Halla, even at this late point in the novel? These questions and more were running through my mind as I read and, while I suppose I was literally reading too much into it, several scenes in the novel seemed very much like they were a glimpse into Episodes 5 and 6. There was one thing about the novel that I can honestly say I did not like, though it was more of a constant ideal or thought pattern than any singular event. I was a far cry into the novel when I simply could not overlook the ideas of “primitive” versus “civilized” any longer. Throughout the entirety of the novel, and most often through Princess Leia, was the subtle discussion of the primitive species on Mimban and how they were uncivilized in comparison with their visitors. Perhaps my ideals are more “modern” from growing up in the 90s, but I find it a bit far-fetched for any one or entity to determine what amounts to being civilized. A culture rich in differences does not make it uncivilized or necessarily primitive and, likewise, a culture ripe with technology is not necessarily civilized or advanced; just different. It reminds me of reading Anna and the King of Siam and reading as Anna Leonowens disregarded the Siamese people as simple and akin to primitives since their culture was nothing like that of the English. That titular character can be forgiven of her ignorance, but as there did not appear to be any of the same redemption from that line of thinking in this novel, I am unwilling to afford Princess Leia the same courtesy. Somehow this unapologetic description of the native Mimbans dates the novel for me, as I cannot imagine a writer of this new century so boldly declaring a culture sad and primitive; it maintains a pre-Civil Rights and pre-Women’s Lib feel to it. A part of me wants to pass off these sporadic claims as coming from Leia’s relatively sheltered and slightly spoiled upbringing, but she was not the only speaking or behaving in such a manner. The Imperials thought in this same manner, as did Luke and it was only Halla who first noted that the Coway considered them (Luke, Leia and Halla) to be the primitives, though this was not until close to the end of the novel. Leia’s disgust with Empire’s dealings with the native Mimbans does not exempt her from a similar line of thinking. The same thought process that allows the Imperials to laugh at the “greenies” as they perform the most menial jobs for just a drop of liquor is the same thought process that goes into deciding what “like us” and civilized and what is not. Despite ringing declarations of what was civilized and what was not, there were parts of the novel that I simply adored and often brought a smile to my face. Some scenes of the novel were downright wonderful and the above was no exception. Their experience in the cave right up to the point that they met the natives was incredibly well-written and, at times, so picturesque that I often wished there was a film made of this novel as well. As always, Darth Vader stole the show for me and brought the novel from a close “Meh” into a definite re-read. Cold, callous and simply evil to the end, Vader brought the Force back into focus and, from his toying with Leia and then Luke to his not-so-complete demise, he was exactly what I had hoped to receive from a “new” Vader appearance. Equally gratifying was that there were few inconsistencies with the character I have grown to love from the films. I can accept just about every move he makes and everything he says as the last scenes seem to fall in line with what I “know” about the character. He is “devoid of any spark of humanity” just as he appears in the films and, while I still wish the irony of Vader removing Luke’s arm in Episode 5 as Luke had done to him could have somehow made it into the films as well, Vader’s character as a whole left me fully satisfied. What I got most from the novel, however, was a great appreciation for Princess Leia. In all the years of watching the films, she had always seemed just a really cool character, but with nothing of the depth of Luke or Yoda or especially Vader. Splinter of the Mind’s Eye allowed me to really “see” Leia as a complete character with a full, unwavering personality and history. Her snarky running commentary, her proud and patriotic sureties, her desire to defeat absolute evil and, of course, how she beat the crap out of Luke after he slapped her in the bar. Leia’s character was so very well-defined and well-drawn in comparison with my first experiences with her that I think I might have found the novel generally satisfying even if Vader hadn’t made an appearance. Foster’s first original foray into what would be known as the Expanded Universe was the complete treat to read and, now, I am primed to continuing delving further into this literary world. The excitement was not as thrilling as “Episode 4’s” novelization, but it was still a delight to read. I must say that it is rare for me to go into a novel with extraordinarily high expectations and, despite not living up to my ideal, still find it enjoyable enough to want to experience it another time. Splinter was not my blockbusting jaw-dropper, but it was still a great ride. My rating ~ 😀 – The Force is strong with this one. On the whole, I thoroughly enjoyed my first real foray into the Star Wars Expanded Universe and my first film novelization. Alan Dean Foster’s writing style took some time to grow accustomed, but once I got a feel for the rhythm of novel, I was able to fall into the fictional world easier each time I began reading. The beginning did start out a bit slow for me since I was not really sure what to expect or how to re-visualize what I reading. The first few chapters went by nauseatingly slow, even with the first descriptions of Vader, as my mind tried to figure out what it was reading. The memories from watching the film began to fight with my own mental images as one side of the brain said, “I think Tatooine looks like this” while the other side said, “But this is how it really looks!” Once that hurdle passed, I still found myself just wanting the novel to get on with it to the point that I was halfway through it and wondering if I had really bit off more than I even wanted to chew. The only thing to really keep me going were the small details that were either changed from the films or left out entirely. The novel started to pick up speed, however, once Han Solo hit the scene; there was just something about his character that was very “readable.” All of his quotes seemed all the more quotable in writing and he was the one character who seemed livelier on the page than in the film. I really enjoyed how Luke’s movements were described during the lightsaber training aboard the Millennium Falcon and also how Kenobi described the elusive and magical nature of the Force. For a brief moment, you begin to fully fall into the fictive dream about how the Force works. I did not, however, feel fully engaged with the novel until we (Luke, Han and Ben) saw what had become of Alderaan. The destruction of Alderaan was far more profound when described in writing. It was almost as if one could feel the magnitude of what happened far more when one is within the collective conscious of Han, Luke and Ben. I cannot count the number of times I have watched Episode IV, but it never really hit me until I read the novelization, that the entire planet, that is, an entire population, ecosystem and way of life was destroyed in an instant and, it was not until this point that Empire appeared as heinous as the film’s characters had been telling me. What brought the novel from “Meh” into the realm of “I’d read it again.” and beyond were just a few lines of Vader’s thoughts. The one thing missing from the original film was little to no insight on Vader’s thoughts apart from dialogue, which I am unwilling to cite as a true flaw in the film since I am not sure how one is really supposed to convey subtle unspoken emotion through an opaque mask. I will concede they managed to get it done towards the very end of Return of the Jedi, but nothing in the vein of the above quote can be executed on screen without the help of a voice-over. It is not until one can “hear” Vader’s thoughts for some magical, grandiose scheme or the flat out notion that he knows he is the greatest of his kind that one fully realizes how sinister he is and, in hindsight, how far he has fallen. The bridge scene with Luke and Leia was very gratifying and it was at this point in the novel that I could finally appreciate the purpose of a film novelization. For once, my imagination and my memory were not struggling for omnipresence. With a clear image of what had happened, my imagination filled in any gaps that may have been missed and the excitement increased as I got to focus on the moment instead of both re-creating the mental image from scratch and the focusing on the prose. There were two points in the novel that simultaneously had me glad I could envision the scene purely as written and could also draw from what I had previously watched; the first being when Vader and Obi-Wan meet and the second when Luke is asked if wanted a new Artoo before the battle. The exchanges between Obi-Wan and Vader were just splendid and, even if I did not have knowledge of all their past history together, I still got the sense that there was a far greater story between the pair than even the characters were letting on at that point. When Luke is asked if he wanted another R2 unit in the novel, I could appreciate what I read, forgetting that I ever saw the prequels, but having the images of Artoo as a “friend” of Anakin Skywalker from the prequels and from Clone Wars made the question and answer pull a smile to my face. Chapter Twelve held the entirety of the Battle of Yavin and it was INCREDIBLE! The action was intense and I loved every minute of it. I had to let out a sigh of exhaustion when I finished because I was so absorbed in what I was reading. The dialogue and prose were even perfectly paced to match the excitement I experienced from the film. As I said earlier, I truly enjoyed reading the novel, but I did have a few disappointments with it that brought me out of the fictive dream, the first of which being the interlude with “Blue Leader” prior to the battle. This character, described only as “older” and “war-worn,” and his dialogue with Luke left me with so many questions that I had to put down the book for a moment and tear through my memory in a wild attempt to place him somewhere. How did Blue Leader know Anakin was a great pilot? If he was “older” then how young could he have been to not only have been old to enough to be “war-worn,” but also young enough to meet Anakin as a boy and know he was a great pilot? Did he fight in the Clone Wars? If so, how did he not know, or at least see fit to mention, that Vader and Anakin were one in the same? In traversing about the Star Wars universe, I have heard theories and counter-theories regarding if Lucas had the entire story of Anakin Skywalker in mind at the time of ANH or not. Reading this now definitely makes me wonder. There were scenes that leaned towards the idea that Lucas did have a master plan in place, such as Han and Luke discussing Leia. It is not experienced to the same degree in the film since we do not have any insight to Han’s thoughts, but the novelization alludes to “something” between Han and Leia in that very scene. Also, the dialogue between Obi-Wan and Vader sounded as if it had been written fresh from watching the last hour of Episode III. On the flip side, there is the above issue with Blue Leader which leaves many questions unanswered for me, at least for the meanwhile. I also wonder if maybe the edition I have has been “updated” to account for later changes in the EU, but if that is the case, why leave all the little kisses between Luke and Leia?!? All in all, I was quite pleased with A New Hope. It started out a little rocky as it battled through my own prejudices, but it pulled a beautiful story out of my initial experience and helped me enjoy what I had already loved to an even greater degree. In the past three months, in between working a little, mentoring a little, and editing Wookieepedia a little, I had been pondering on what, if any, Star Wars items I could see myself collecting. At first, everything I saw looked completely overwhelming to the point that I could not see anywhere to dip my feet into the collecting pool or even where the best place to simply take a great plunge was. There were key chains and figurines and 10-inch R2’s just waiting to be chosen as well as beautiful prints, hats, busts, Obi-Wan Kenobi boots and those ever-covetous Anakin Skywalker lightsabers. Zounds! The options! Simply put, I had no idea where to begin (though my ‘lil Vader hoodie is en route as I type). Even my fail safe love of books left me at a loss when I took a good look at the lengthy list at Wookieepedia that shows all the different novels that made up the EU. I know I counted at least a hundred, without even including the youth novels and non-fiction works out there as well, and quite a few of these were out of print. All this notwithstanding, I have loved literature since I was a kid and, if my own sense of self-satisfaction cannot be met through the unlikely goal of obtaining every single novel of the expanded universe, I can certainly satiate my pseudo-collecting desires by at least attempting to read as many of those said books as possible. I now battle my long held stigmas of science fiction literature to learn about the Rule of Two and Yuuzhan Vong, about Naga Sadow and Admiral Thrawn, and to finally learn what happened just before the end of the Clone Wars and just after Anakin Skywalker redeemed himself. The written word has always fascinated me and so I see the books of the EU a fitting method of cementing Star Wars into my life, (fanfiction will probably follow suit as I have started making notes on my very first one). Episode IV: A New Hope – Review! Splinter of the Mind’s Eye – Review! Lost Tribe of the Sith: Precipice – Review for all 4! Episode III: Revenge of the Sith – I am anticipating this one more than any other novel as I have heard amazing reviews of the book from both Star Wars fans and otherwise. Episode V: The Empire Strikes Back – Both anticipating and dreading this one. Novelizations can be almost tedious in comparison to their respective films and, with this being one of my favorite films of all time, I am not sure the novelization will live up to my standards. Heir to the Empire – I am intrigued by the Thrawn Triology as these books began what started the river of EU books that followed in the past two decades. That said, a part of me thinks that there is no way these can live up to the hype I have placed on them. Vector Prime – I have been shaking with anticipation to start the New Jedi Order series since I first caught an article about the Vong on Wookieepedia. Out of the whole mix, I think I may enjoy these the most. Anyone who perused the list may notice that there were whole series I decided to skip and this was intentional. I spent hours skimming through summaries to choose what I thought would interest me the most. I am not sure if this master list is even doable, but that is why I called this a Challenge! instead of my Life-Long Reading List. That said, I am sure there are a few gems I might have missed based on summary since poor summaries can be made about fantastic books, but this is the challenge I have presented to myself and I am going to run through this list heartily. The goal is also review each one I complete, but I will satisfied if I can just get through the list. I suppose delving into the comics will be the next step in my mental collection, but that is a topic for another day. I’ve not written on this blog in almost a year. Not for lack of love, I might say. I’ve got at least seven drafted posts just sitting and waiting; most are completely outdated by now. No, the absence of writing was mostly due to simply too darn much happening at the same time. In 2009, I buried four relatives, stopped watching any and all television and completed a very rough draft to what I hope to be my first novel. I’ve also become an “every so often” church member; I’m not proud of this by any means. A part of me feels this blog has run its course, but on the other hand, I know I’ve got plenty more to say. I suppose I sound a bit unsophisticated and rough since I’ve just finished a rather lengthy blog post about Star Wars (yeah, it’s insane how big a geek I am now), so I’ll make this short. About four years ago, I started something on Mother’s Day and it worked out pretty well for me (the whole making an effort and finding Jesus, thing), so this Mother’s Day, I’ll make a new commitment, a commitment to write. I’ve got much to say and, if I keep my creative juices flowing…well, I’m not entirely sure what will happen, but either way, I’d just like to keep writing. I remember quite clearly, how the Easter basket that lay on our dining room table picked up the light from the nearby window as its topmost gift shined across the room. I cannot remember what else my mother had got for me that year as an Easter gift and, likewise, I cannot remember much of 1996, but I can remember watching A New Hope on VHS for the very first time. My mother had thought it incredulous that her only child had not viewed one of the most classic films of all time and had bought it for me “just because.” Her single gift began the flame that flickered and kindled until it roared to life in the early 2000s. The music was what first caught my attention. Looking back, it seemed that I had already known the music, but was finally able to put it in context. I was then annoyed at the film because I was not able to read all of the beginning story (VHS = no wide screen), but afterward, my mouth hung open for two hours. the way Luke looked as he stared at the triple sunset…I could go on forever. I was completely enamored with everything I saw. After my first viewing of ANH, I began to watch it once a week. I adored Princess Leia, was in love with Luke Skywalker and was scheming to get my own R2-D2 as my weekly viewings turned into daily viewings. By my eleventh birthday, I obtained Empire Strikes Back and Return of the Jedi and with the “full story” before me, I was poised to make a full leap into the Star Wars universe. Unfortunately, there was need for hesitation. Star Wars was (and, really, still is) for the nerdy kids and, if that was not bad enough, The X-Files was taking up all the obsessive love I had to give. With adolescence’s cliques and challenges standing before me, there was no way I could hide both X-Files and Star Wars fandom from that table. So, as much as I loved my beautiful VHS trilogy, my love of Star Wars was put on hold. The year 1999 brought high school and The Phantom Menace simultaneously. While I was indubitably excited about having the chance to see a Star Wars film on the big screen and there was some noise being made about the new film amongst my peers, my desire to remain a part of my clique won over my desire to see TPM and I let the opening weekend pass without a flutter. Poor critiques of the film, most regarding “that kid” and some apparently annoying character called “Jar-Jar” kept me from seeing TPM on my own and, as the film went out of the theatres, my desires for Star Wars seemed to fade as well. By chance, however, my neighbors, always keen to be the first to have every new technology and every new film, obtained TPM on DVD and, one night while babysitting their kid, I enticed the youngster to watch the film with me. To be honest, there were moments I forgot my temporary ward was there. I loved everything I saw. From the opening, to the new worlds, to Amidala’s wardrobe and especially to Liam Neeson. With dozens of people and all the media “telling” me Jar-Jar was irritating, I was truly expecting Carrot Top on speed, but was pleasantly surprised that Jar-Jar did not live up to my worst expectations; young anakin also was not that bad (at least, for the first viewing). The podrace, the music, the species and the battles all enthralled me and re-kindled that old Star Wars fire that had lain dormant, unloved and unwanted, for years and…I wanted more. Thankfully, Attack of the Clones was just around the corner and I had grown old enough to know how I wanted to be viewed as a person. The bore of high school was nearly complete and I had left its cliques and nonsense when I started half-days, opting to begin collegiate work sooner rather than later. Overall, I was a completely different person than I was when TPM was shown and, when AotC came to theatres, I made certain that I saw it that opening weekend. As expected, I was floored. Watching Star Wars on the big screen was everything I thought it could be and much, much more. And, I admit it…I fell for Anakin, hard. I went back to see it on my own the next week and the week after that as well. In all, I saw AotC seven times in the theatres, the most for any film (runners up are Harry Potter and Chambers of Secrets and Revenge of the Sith, both at 6 times). The best part was that I did not care whether anyone knew I was going to see Star Wars, again, and that, more than anything made watching the film even better. After AotC, I began my first dips into the Star Wars community and entered the realm of fan fiction. I just needed more. I wanted more of the story, more Anakin, more Padme, more Obi-Wan. More, more, more! I bought posters and read stories and bought music and read the stories while I listened to the music with posters in the background. At one point, I even began making notes to my own fic. The more I read, the more I learned and the more I learned the more I loved, but like years earlier, another obsession moved Star Wars out of favor: the aforementioned Harry Potter. Potter took hold and, once again, there was no room for Star Wars, but Potter unfettered the deep nerd within me. For once, I was no longer afraid of what others would think if I were found reading fantasy or visiting science fiction forums and, for the first time, I felt like myself. By the time Revenge of the Sith was released, however, my Potter love had faded and I was primed for Star Wars. Wearing my very own cloak, I dragged my best friend to a midnight showing of RotS where I was ashamedly underdressed as far fans went and was again, floored by what I saw. To this day, I still do not care what others may say: RotS is one of the best of the films. In fact my “order” goes Episodes 5, 3, 4, 6, 2, 1; 4 and 6 sometimes trade places, but that is almost always the order. Needless to say, I loved Episode 3. I went on to see it five other times, bringing friends some times and going alone to sit in the second row where I always loved to sit, other times; I bought the soundtrack immediately after Viewing #3. To say that RotS revamped my Star Wars love is a bit of an understatement. All that went on with AotC was just a drop in the bucket in comparison. I spent so much time reveling in the Star Wars universe, watching the films, visiting forums, reading fan fiction, etc., that others began to take notice and tried to drag me away from it. My friends even threatened intervention if they found me with a Star Wars book and so I lessened the time I spent with the universe, allowing the love to fade…slightly. Since RotS, I took steps into the working world, walked across a baccalaureate stage and found Jesus, all the while, my adoration of Star Wars was at the back of my mind, pulling me towards “old” websites and occasionally reading things I had told my friends I had given up for the time being. In the past year, I found Wookieepedia and with it, the desire to finally know everything there is to know about Star Wars. I find myself wanting to read the novels, not just because a film of similar name is in theatres, but because I honestly want to know what happens between and beyond the films. Editing Wookieepedia here and there, entails hours of reading and learning about the expanded universe and makes me want to learn even more through reading the books and comics that make up the entirety of the expanded universe. I have a very long way to go (I just started reading Episode 1 and, as of this writing, Luke and Obi-Wan had just met Han Solo), but this time around, I doubt my adoration will be fading much. I know many fans believe that the prequel films were the worst thing that has ever happened to any series, at any point in time, but I beg to differ. The prequels brought an entirely new generation to Star Wars in a manner that could never have happened without new faces and new stories. I know that had I not seen a young Obi-Wan, the “real” Anakin Skywalker and Yoda battle with a lightsaber, I would never have bothered to learn more about Star Wars and the expanded universe. In all, I love the story. I love the idea of the Jedi, the Sith and the Force, and I love the rise and fall of Anakin Skywalker. My goals here are simple. I am not a rabid, super-fan of Star Wars and I doubt I will ever be. I am not a toy collector (except for Darth Tater because it was just so cute!) and I am just not that into comics. I just want to let loose a little and take hold of that which has had such a hold on me, since I was a child.